SARA (for scanning, analysis, response, and assessment) is a common tool used to implement problem-oriented policing in mainstream law enforcement. This is part 4 of an on-going series on Risk-based Compliance (RBC) programs for fisheries, with Australia serving as the prime example. Depending on who you ask, there there are three paradigms in policing. The first is “incident-specific policing”, which has police officers respond in a reactive way to problems. That is, they act to address specific incidents as they encounter them through their patrolling or the reporting of citizens (such as through special hotlines). The second is “community policing”, which has police officers build deeper connections, if not collaborations, with citizens to address a variety of crime issues within specific geographies. For mainstream crime, you can think of community watch programs, and in fisheries, community-monitoring programs (for example). The third is “problem-oriented policing” (POP), which has police officers focus on the root problems of crime incidents in a structured and focused manner. The best examples of this for mainstream crime can be found among the winners of the annual “Goldstein Awards” for problem-oriented policing, which include among them awards for inter-agency collaborations and community partnerships to reduce bicycle thefts in London, on-street homeless populations and their related infractions in Colorado Springs, CO, and requests for police at hotels and motels in Chula Vista, CA. Apart from these exciting case studies, POP is quite intriguing because unlike other methods of policing, there is a good amount of scientific evidence that it is effective in reducing overall crime rates. Unfortunately, POP in the fisheries world is pretty rare. Sure, fisheries agencies conduct undercover operations (for example), but generally these operations are not targeted at the underlying problems. Take a look at AFMA’s approach to risk treatments, however, and you’ll see a great example of POP. I think one good reason for this is work that is done as part of the overarching Risk-based Compliance program. That is, if you have identified specific systemic risks and prioritized a sub-set of them as pressing problems, then you’re already halfway there to POP (see graphic above). So how is POP implemented in Australian Commonwealth fisheries? Step (1). Identify – the risk assessment process where risks are identified, evaluated and prioritised. The OMC will nominate risks to be treated by CRMTs in accordance with the compliance risk treatment cycle. A CRMT is to be established for each nominated risk. Step (3). Set a performance target or goal – define what it is you intend to achieve (e.g. no. of incidents detected to be reduced by 50%). Step (4). Select a strategy (or strategies) – identify a method or methods to be applied to the risk (e.g. surveillance, education programs, operations etc) which can reduce the risk, including determining the extent or depth. Step (5). Implement the strategy – undertake the selected strategy. Step (6). Assess/Measure – using a baseline figure (where possible) evaluate the effectiveness of the strategy by monitoring the risk level. Step (7). Evaluate – assess the effectiveness of the strategy chosen and adjust or change as appropriate. * It may not always be possible to measure the risk; this does not mean action should not be taken to address the prioritised risk. It may be possible to use indirect indicators. AFMA’s CRMTs typically consist of fisheries officers, intelligence officers, planning officers, and fisheries management officers and are, as noted above, tasked to address one specific risk. Looking at the CRMT process, I see I’ve got a number of great examples to provide you. Past/present CRMTs have targeted risks including the failure of vessels to report interactions/retentions of protected species, fish receiver reporting fraud, and quota evasion by fishing operators. However, to keep things short, I’ll share with you my two favorites and interrelated CRMTs: the Closure Compliance Risk Management Team and the VMS Compliance Risk Management Team. I particularly like these programs as VMS is widely recognized as an excellent tool in theory, but a challenge in practice. This is largely because inferring fishing behavior from GPS data can be tricky and the systems are easy to manipulate and turn-off. Just looking at the graphic showing the number of vessels suspected of closure violations, you can imagine that this CRMT, which aimed to greatly reduce such suspected violated, was vastly successful. Score “1” for problem-oriented policing in Australian fisheries. In 2010 the ‘Closures CRMT’ proposed the use of a ‘show cause’ model for addressing the prioritised risk of boats fishing or navigating within closed areas. The model was subsequently endorsed by the OMC and implemented by the CRMT. In this model, operators assessed as having fished or navigated within closures were supplied with a month long snapshot of their activity (as depicted on AFMA’s Vessel Monitoring System), highlighting the entry into, activity within and exit from the closure(s). The operator was also asked to provide an explanation of the activity and told that if they were unable to provide satisfactory explanations for their actions that they may face compliance action. that non compliance to closures is likely to be detected. Since its commencement, in June 2010, the program has resulted in a reduction in the number of suspected closure breaches of almost 90%. 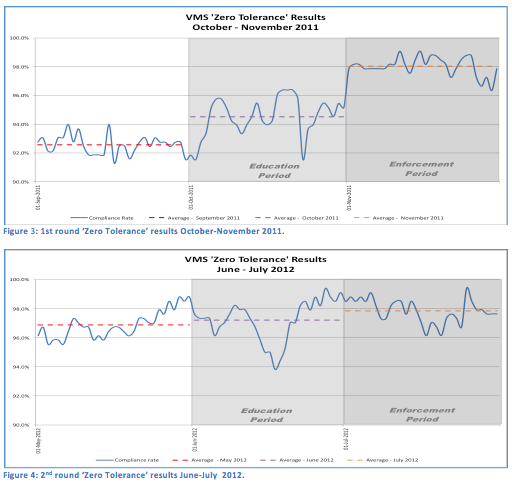 This next graphic depicts three months of data for 2011 and 2012 of suspected compliance with the rule that vessels are to be broadcasting their GPS coordinates with vessel-monitoring systems (VMS) at all times. As you can see, an education period, followed by a month where there was “zero tolerance” for violations led to significant changes in compliance. Furthermore, there’s some evidence that compliance was higher the following year (97% compared to the 93% observed the year before during the control month). 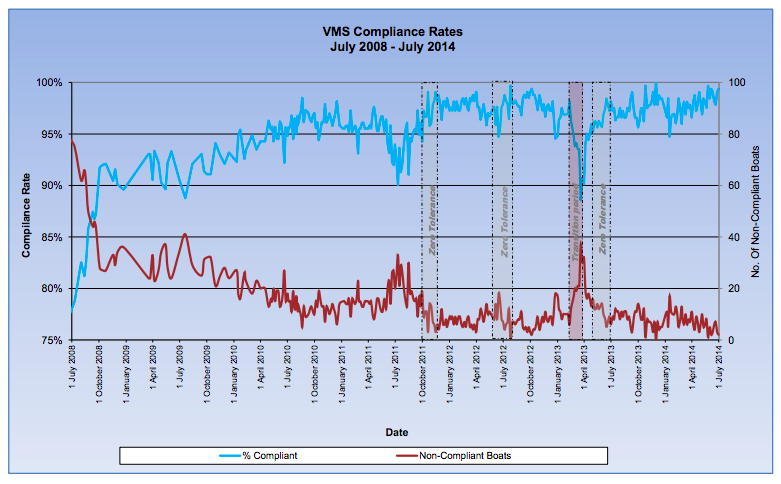 And taking a more long-term perspective, you see a marked improvement in VMS compliance rates. Given that this initiative was the brain child of AFMA’s CRMT for VMS compliance, I think you have yet more evidence of POP working for Australian fisheries. Despite the relative success of the routine monitoring programs, in identifying and addressing non-compliant operators, rates of Vessel Monitoring System (VMS) non-compliance have periodically been at a level of concern. As a result the VMS Compliance Risk Management Team (CRMT) proposed the use of a ‘zero tolerance’ program whereby the minimum level of enforcement action was ‘escalated’ for a discrete period of time. 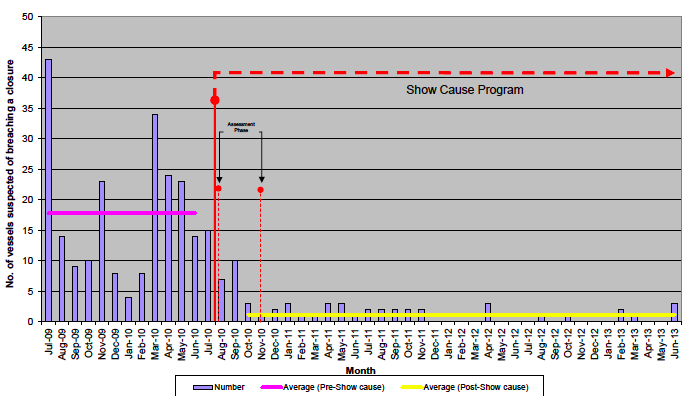 To date three programs have been run with one in October-November 2011, one in June-July 2012 and one in May – June 2013. Outstanding blog post! Great work. I will plan to do my own blog post talking about your blog postâ¦ pointing people to you, mentioning you as a colleague, and demonstrating (for both of us) that we are not the only people working in this area. Let me know your schedule and letâs have lunch again. Oh, that Seafood Fraud article as moving forward and then the author got busy againâ¦ this just reminded me to reconnect with her. institution and this email exchange could become public information.